PROBABLY PROTO CENTRAL EASTERN POLYNESIAN, POSSIBLY PROTO NUCLEAR POLYNESIAN: Terminalia cattapa (Combretaceae). Appears to ultimately be derived from Proto Malayo-Polynesian *kayu "a tree" and Proto Polynesian *Qariki "a chief". This is a widely distributed tropical tree, Terminalia catappa, growing natively throughout Southeast Asia, Northern Australia and many parts of Polynesia. It is known in Eastern Polynesia by names which seem to be derived from a combination of the old Austronesian word for "tree", *kayu, and the Proto-Polynesian *Qariki, "a chief". This is reflected in the usual Samoan (and, in one form or another, Western Polynesian) word for the tree, talie, from Proto Polynesian *talie ~*telie, from Proto Malayo-Polynesian *talisay (with cognates throughout Austronesia, e.g. 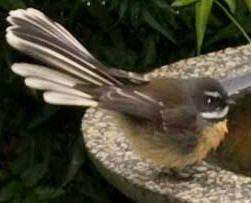 Tagalog talisay, still designating T. catappa and sometimes other species of Terminalia). In Samoan, the word 'auali'i was recorded by the Rev. George Pratt in the 19th Century as meaning "1. A talie tree (Terminalia). 2. A keel of a canoe made from talie. A chief's word." However, even though this signifies that the word has been an alternative to talie in Samoa for well over a century, some lexicographers think that in this sense it was actually introduced from Tahiti (cf. the Rensch & Whistler Dictionary, p. 36). 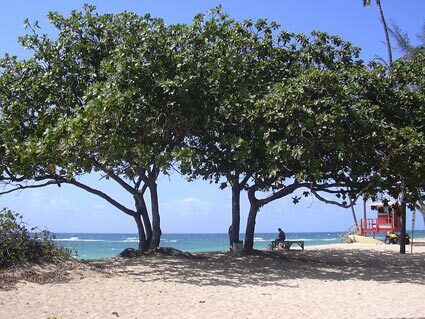 I think that the solution to this conundrum may be that the second meaning listed by Mr Pratt may be the original one, as the *talie/*kaualiki tree is a seaside one, often planted to provide shade, and the kind of place where a chief might well address his assembled followers or advisors. So the word itself may be Proto Nuclear Polynesian (as it is listed in the Pollex database), but Proto Central Eastern Polynesian as a replacement for the older *talie. 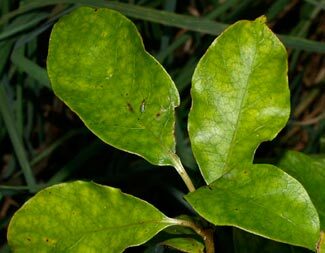 However this may be, looking at the large, prominently veined leaves of this tree, and the small, inconspicuous flowers, it is not at all surprising that in Aotearoa the name was given to Coprosma grandifolia. An alternative name for the Terminalia tree, *taraire, developed in Proto Tahitic era, and is reflected in that sense in Mangaian (another Cook Island Polynesian language) and Tuamotuan (this is the name for yet another large-leaved tree, Beilschmeidia tarairi, in New Zealand Mäori). The tree is often called the "tropical almond", because the edible kernels of the nuts have an almond-like taste. As attested by the Samoan meaning, the water-resistant wood has been used in Polynesia in canoe construction, although the predominant use has probably been as a shade tree. Note: The Samoan cognate as a tree name may be a more recent introduction from Tahiti -- see text opposite. Alternative Proto Tahitic word: *taraire. 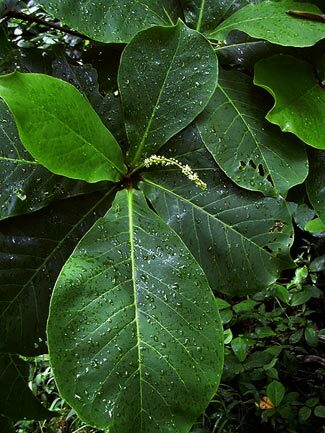 Further information: There are 48,000 pages with references to Terminalia catappa on the web (in April 2010), but probably the (unreferenced) page on Wikipedia, and a commercially-oriented page on the tree's medicinal uses on the Tropilab site give as good a general overview as most. There is also information and photographs on Terminalia catappa, T. glabrata and T. samoensis on the Cook Islands biodiversity database. The University of Hawaii's College of Tropical Agriculture's site has a useful information page about T. catappa. Sources of photographs: The pictures of Terminalia catappa are by Forest and Kim Starr (Hawaii); the Coprosma is growing in Te Mära Reo.